The holiday apartments at Ocean Club at Ramla Bay in Malta have their own private 350 metre coastline incorporating a sandy beach and overlook Comino and Gozo. Spacious studios sleep two, one bedroom units sleep four and two bedroom units sleep six. For an extra fee per person per day, each apartment can occupy a further two guests. The apartments are spacious with comfortable furnishings, air-conditioning, fully equipped kitchen, full bathroom and television. There is a complete supply of all bedding, linens and cooking utensils. All the studios are very spacious with a full size bed. The onsite restaurant offers terrace dining in summer. 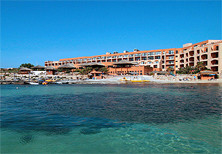 Sporting facilities including a modern seaside pool, windsurfing and waterskiing. A reception, restaurant, bar and beach can all be found on site. 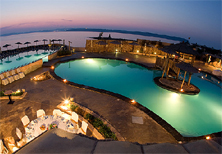 The outdoor pools/and watersports are available in the summer months only, typically April to Oct inclusive. The beautiful indoor pool, gym and spa facilities are available all year round.